When I built Scenic Ridge, I had it easy. 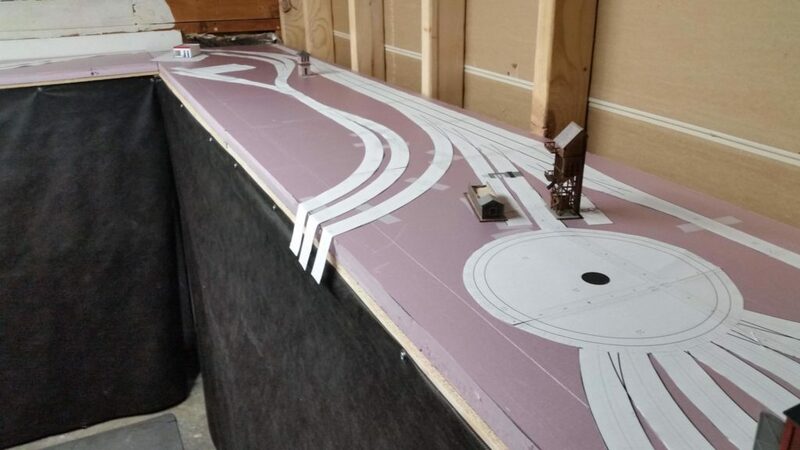 The kit from Woodland Scenics came with 3 sections of styrofoam with the track plan already printed on it, which made it easy to lay the track. This time around, I would need to figure out how to transfer the plan I’d designed in xtrackcad (a free track planning software package) full-size to the layout benchwork. 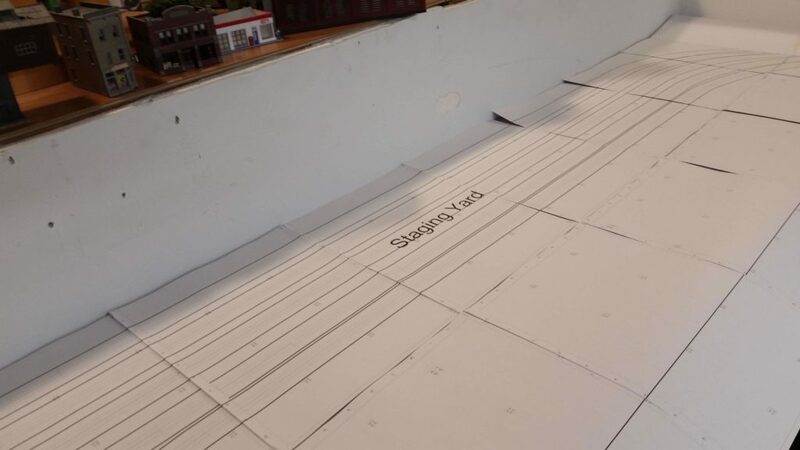 After some investigation, I discovered that xtrackcad could print the plan full-size, breaking it into 8.5″ x 11″ sheets. It would also print the outline of the roadbed on the plan. I dumped it to a PDF file, then sent it to OfficeMax to be printed (doing so was much more cost-effective than using up a ton of ink in my own inkjet printer). 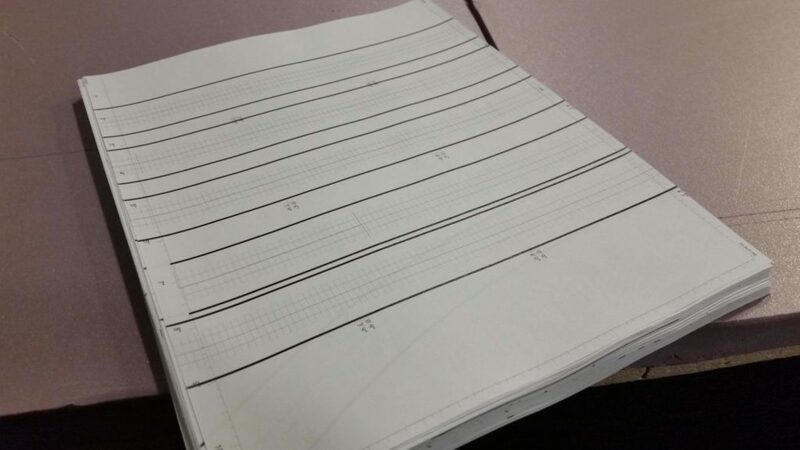 When I picked up the track plan, I had 72 sheets of 8.5″ x 11″ paper. The full-size track plan… I never really liked puzzles. 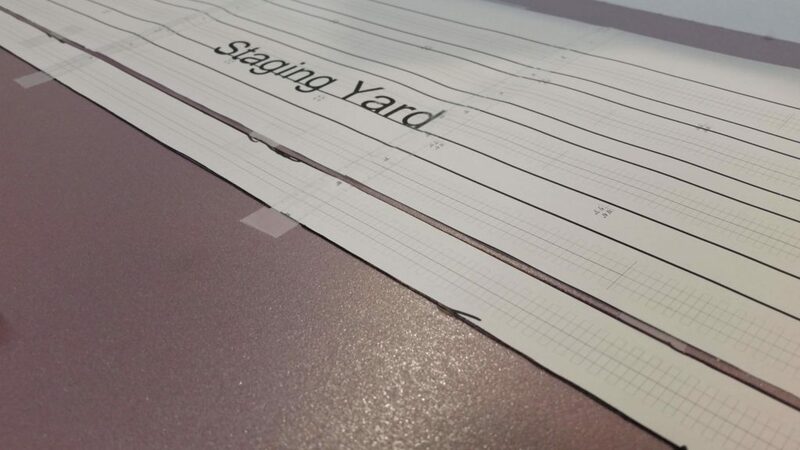 Each sheet of the plan had index markings and measurement markings to aid in getting everything lined up properly. I proceeded to lay the sheets out on the layout, taping them together as I went. Once the plan was placed, I used a sharp utility knife to cut along the roadbed lines, removing the excess paper. This left just the actual track plan on the benchwork. I then traced the edges with a black sharpie, marking out where the roadbed would go. Cutting the track plan out. The track plan cut out. Test-fitting a couple of yard/loco facility structures. 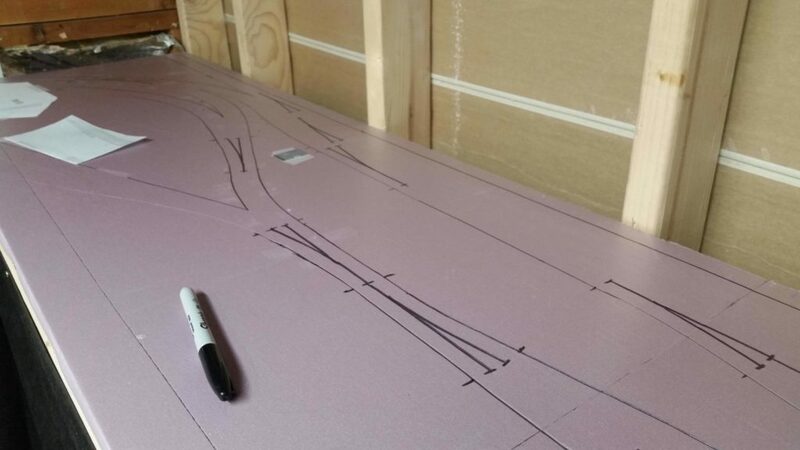 I traced the paper track plan with a sharpie. 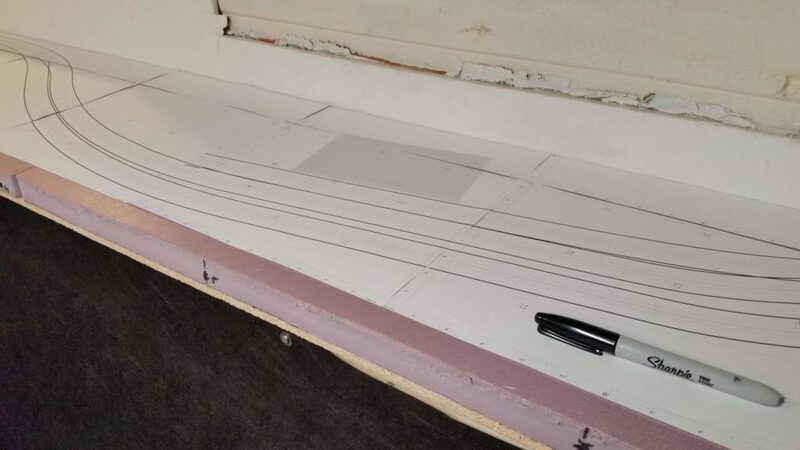 I also cut through the track plan where turnouts were indicated (leaving a scored line in the foam) so I could then go over that with a sharpie. 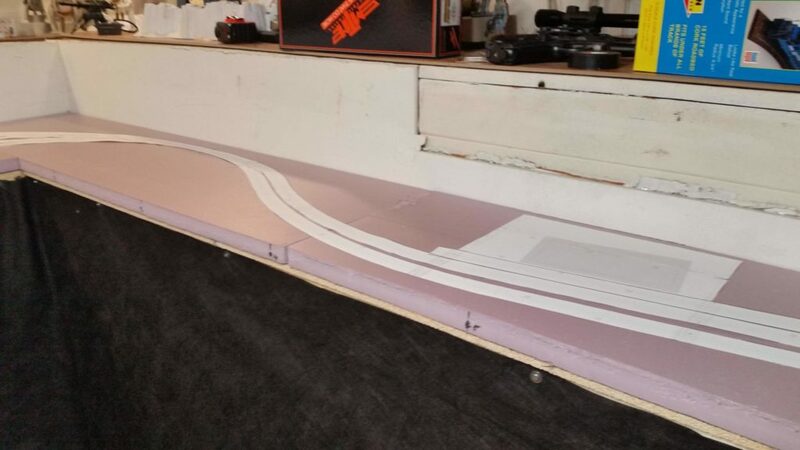 Once the track plan was transferred to the foam, it was time to start gluing down roadbed. Want to be notified when I make new posts about the layout build? Use the “subscribe” option at the left (you may have to scroll up), enter your email address, and mark “Trains and Model Railroading”.